Transparent Window Manager is a virtual desktop that enables you to manage windows settings. The application lets you set the transparency of any window, place specific windows on top, but also disable input for any window. 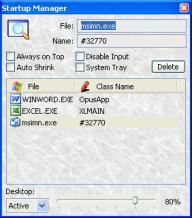 The application makes it possible to work with multiple programs even on small-sized monitors. Furthermore, Transparent Window Manager allows you to place any application to the Windows System Tray, which may come in handy when you have multiple programs running at the same time.